I'm just back to the US, and now I can say a bit more about where I was and what I was doing. Some readers might recall that last month I published an essay in Foreign Policy magazine, "How to Talk to America", cast as a memo to the Supreme Guide of the Muslim Brotherhood Mohammed Mehdi Akef. So last week I flew to Cairo, where I spent four intense days of meetings and discussions with more than 25 people. I got to talk with most of the leadership of the Muslim Brotherhood which isn't currently in prison, about a dozen Muslim Brotherhood bloggers and activists, a number of Egyptian analysts with keen insight into the Brotherhood such as Diya Rashwan and Khalil el-Anani, and of course the usual journalist suspects (i.e. my friends). I was also interviewed by al-Masry al-Youm and al-Dustour, which may prove entertaining depending on what gets published. My deepest thanks here go to Abd el-Monem Mahmoud (who you might remember him as the MB blogger arrested and tortured several months ago); Monem was my constant companion over the last week, and I can't say how much I appreciate his tireless good humor and flexibility and tolerance for my occasional struggles with his Alexandrian colloquial Arabic! I'm not going to go into great detail about what I found, since I am going to be publishing articles very soon exploring each of the three main topics of my research, but I thought I could at least give an idea of what I was doing. The visit had three main objectives. First, to actually begin to talk to the leadership of the Muslim Brotherhood about the possibilities of dialogue with America - not, I must stress, as any kind of channel but simply to explore their responses to my memo and their thoughts about the future of the organization's relations with the United States. Most of the leaders had read the memo, and came into the meetings with some detailed criticisms and complaints - I was impressed that Akef made the effort to thank me for the "good advice" in English (though other than that all the conversations were in Arabic). I found people at all levels of the organization delighted to talk to me, and very generous with their time and ideas, but few were particularly forthcoming with regard to the idea of dialogue. Most emphasized that they valued dialogue in principle, and some went so far as to say that they would be happy to talk with any American government - even Bush - if it admitted American mistakes and changed US polices. But overall, I did not come away with a sense that many Brotherhood leaders saw much value in any official dialogue with the US right now: discussion with researchers such as myself, yes, but not political dialogue of any sort. This didn't really surprise me, since it's consistent with what they've been saying in their interviews and public statements for quite some time (including in Akef's contentious interview published in al-Dustour the day I arrived, where he basically said that the Brotherhood had nothing to do with calls for dialogues with the West such as mine). The discussions were still valuable, though. Many of the MB leaders are clearly keen to be better understood in the West, and bitter over what they see as misconceptions about them. I tried to push back against their understanding of what this entailed, which actually reminded me of nothing more than the Bush administration's concept of public diplomacy: they see the problem lying primarily in misunderstandings on the other side, so the problem is to better explain themselves and correct these false impressions. I tried to convince them that the problems went deeper than that, and that they needed to engage in real dialogues which might expose their own inconsistencies and shortcomings and not only "fix" faulty American understandings. I pushed the Brotherhood leaders quite hard in explaining where Americans had doubts about their intentions and emphasizing the need for actions which matched their words. I also tried to emphasize the need for active rather than passive steps: when an Islamist radical files a "hisba" suit against a liberal, or declares takfir on someone, it isn't enough to just disagree privately or say that the MB doesn't have anything to do with such things - strong, clear, public condemnation would have much more of an impact. I don't know if any of this had any effect, but they seemed to listen carefully. Anyway, I'll be writing this up in an article quite soon; stay tuned. Second, I wanted to explore the controversial political party platform which the Brotherhood circulated to about 50 Egyptian intellectuals last month, which aroused quite a public controversy because of the presence of several inflammatory new ideas such as a "Higher Ulema Council" and a rejection of a Christian or woman president. Again, I'm not going to go into too much detail about what I found out on this topic, simply because I will have lengthy article coming out about it in a few weeks. The background, for those who haven't been following the story, is that the Brotherhood has been working on a political party platform. Several earlier drafts which were published in al-Masry al-Youm newspaper and Islam Online closely resembled earlier MB programmatic statements, and were consistent with the MB's evolving political discourse. But the platform which was distributed in preliminary form to the intellectuals shocked everyone (including me), and sparked a fiercely negative public response. Analysts hostile to the MB went to town on it, claiming that it revealed the true, despotic, radical face of the MB: Abd al-Monem al-Said, for instance, called it a program for MB religious state along the Iranian model. Even analysts sympathetic to the MB such as Amru Shoukbi and Diya Rashwan were fiercely critical. Personally, I was quite taken aback since the draft was such a major departure from the two previous ones - leading me to put on hold an article about the MB and democracy which had been almost ready for the copyeditor until I could look at this more closely. After my conversations, it is clear to me that the Brotherhood's leadership is divided about the party platform, with some defending it as written and others bluntly stating that of course it will be changed. The draft party platform isn't the "true face" of the MB, but it is one face of the MB and it is profoundly unclear whether it is a more powerful trend than the more pragmatic political trend which had produced earlier documents. Some of the criticism has gone public (Abou el-Fattouh and Gamal Hishmet have both publicly dissented, while Essam el-Erian on his release from prison said that he hadn't even seen the program before it's release - it seems likely that the fact that Erian, Kheirat al-Shater, and several other of the key pragmatists in the organization were in prison at the time let the more conservative faction rewrite the platform into its current form). They were all keen to explain to me that the controversial Higher Ulema Council would only be advisory, not compulsory, and that sovereignty would still rest in the elected Parliament and the Constitutional Court. They argued that their purpose had not been to create a new religious authority, but rather to create a new body which would be elected and independent of the Executive Branch - taking power away from al-Azhar rather than imposing Shia-style religious authority. Abou el-Fattouh, in the picture above, was going through the program line by line to show me that this what it actually said. On the question of whether there could be a Christian or woman president, the party line now seems to be that it simply could never happen in Egypt since Muslims wouldn't vote that way - begging the question of why it would need to be written into the platform that they can't. But in one especially interesting exchange, Abou el-Fattouh told me that he would vote for the prominent Coptic Christian intellectual Rafik Habib over Gamal Mubarak. For all their efforts to explain themselves, most seem to recognize that they have a problem, since one of the main objectives of the platform was to reassure other Egyptians about their intentions - something which has spectacularly backfired and left them open to all kinds of attacks from skeptics. It will be very interesting to see if it really does change - and an important test of the internal balance of power in the MB and the depth of their interest in responding to the concerns of their fellow citizens (and, of course, the West). Finally, I wanted to follow up on an article I wrote about Muslim Brotherhood bloggers earlier this year, to learn more about this new generation of Brotherhood bloggers and activists. This was a smashing success, as I got to meet a wide range of young activists from different trends - mostly, but not entirely, from the Brotherhood (including several very impressive young women - don't be fooled by the picture above). I'm running out of steam now and don't have the time to go into those meetings in as much depth, but it was really fascinating. The MB bloggers represent an important new phenomenon. I was struck by the point made by many of them that it isn't only Americans who usually don't know any MB members personally - even in Egypt, most people don't know any MB members personally. The blogs, argue the bloggers, humanize the MB and have let them start building connections and relationships among themselves and with non-MB youth. 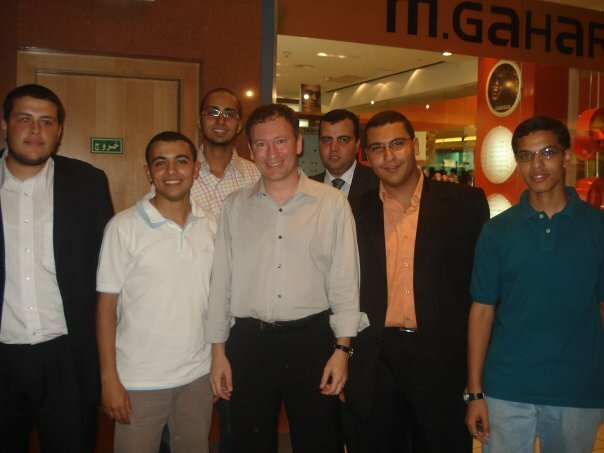 MB bloggers have also raised some of the most biting public criticisms of the organization itself, such as Abd al-Monem Mahmoud's critique of the political party platform - which generated over 50 comments, cross-blog controversies, and a spirited public argument which offers a fascinating glimpse into the controversies and ideas within the MB youth. Some of the older MB clearly worry about exposing these disagreements in public, but others - including the imprisoned Kheirat al-Shater - have encouraged the MB blogging phenomenon as a way of revitalizing the organization and energizing its youth. I'll have much more to say about this soon. I do want to thank Abd al-Rahman Ayesh, who participated in one of my meetings with the MB bloggers, for the nicest thing anyone said about the whole trip: in his post about our meeting, he called me "young"... just as chatting with these young, spirited activists in a giant mall in Cairo had driven me to gloomy reflections on the fact that I could no longer fit anyone's definition of "youth". Really I don't know what to say Prof. Marc. This is exactly the sort of thing that the American government should be fostering: informed and good-faith dialog! There is room for understanding and compromise between the US and groups like the MB if both sides are willing to give and take. If this sort of thing flowers, the prospect of greater MB power in Egypt can be shown to not be such a danger that the US feels it must continue slavish support for Mubarak's vampire government. The very existence of a debate about the draft platform is extremely encouraging, as is the seeming sensitivity to outside feelings on the matter. Also, that they are willing to talk to the US if the US admits mistakes gives credence to my long-held hope that the Bush administration has not(despite it's best efforts) permanently poisoned relations with MENA societies and that a strong push from a new administration could rebuild bridges remarkably quickly if it set out to do so. I am curious though Prof Lynch, did you have much trouble with any mukhabarat goons? They must have taken an interest an American meeting with so many MB members. I think Marc was smart not to preannounce. However, i doubt he would have been harrassed if he had. Foreigners are still by and large being left alone by the government. My car from the hotel actually was stopped at one of the airport checkpoints and searched and there was some tension... but it turned out to just be the routinely random security harrassment which is one of the charming characteristics of the Egyptian state and not directed at me personally, thankfully. I don't see the point of advising the Muslim Brotherhood on their PR - an organisation that consistently attacks Mubarak for being too liberal (a feat in itself). Anyway, the MB's main problem isn't one of PR as they've already mastered the double talk: saying one thing in English and something completely different in Arabic (usually on the subject of punishments or women). They know how to play the game, and given that some academic goons were recently trying to sell them as an Islamic version of Germany's Christian Democrats it seems they've got a ready audience. Gaurdian, there is no double talk by the MB. What you and many others don’t realize quite yet that within the MB there is a new, progressive and proactive trend that is more pragmatic and is trying to make its voice heard. Ikhwanweb just happened to be more representative of that trend than other Arabic websites since our mission is to reconcile the MB difference with the West. I can reassure you that the MB's moderate English voice is genuine and not tactical. I am sure Marc can elaborate further on that. I encourage you to continue to follow our website and interact with our members and find out yourself. Great to hear about this trip, Prof! And guardian reading liberal, it's funny that you should mention your concern about a difference between the Egyptian Muslim Brotherhood's statements in English and its statements in Arabic. Professor Lynch just addressed that in a blog post recently! I'll have to comb back through the archives...but if you want to, I know it's no more than 3 months back. Anyway, I'll admit that he did not compare their statements about women in English to their statements about women in Arabic. What he compared (and said matched up) were their statements about political strategies they considered appropriate and what they thought of the use of violence in English and Arabic. So yeah, that's not exactly what you mentioned, but it's within the same subject realm. Hope that introduces a ray of sunshine into your thoughts as you mull over what it would be like for the West to interact with the MB. Interesting post! I am a student doing a master's degree on the subject of the Brotherhood and democracy, and I'm eager to hear more about this new platform, as the part about an ulama council seems new compared to previous statements, and this is a rather crucial question in my thesis. It seems the platform has not been publicized officially, but do you know if it is possible for me to access the "unofficial version" that is discussed above? (I read Arabic). "...there is a new, progressive and proactive trend that is more pragmatic and is trying to make its voice heard... I can reassure you that the MB's moderate English voice is genuine and not tactical. I am sure Marc can elaborate further on that." Here's the problem. There's an elite of more liberal (for lack of a better word) brothers in cairo that are pushing a more pluralistic vision. But the drafts of the party platform don't seem to reflect those people's views. The current draft, as i understand it, does rule out copts and women for the presidency, and does propose a Majlis Ulama that average citizens won't have electoral control over to determine what legislation is or is not "islamic." These provisions, if they come out in the final draft, will not only alienate egyptian copts and secularists(the mere fact that they've been included in drafts has left a bad taste in peoples' mouths already) but many of the western liberals that want to give you guys a fair shake. No doubt the MB knows this. So why, then, are these provisions there? My assumption is that the religiously conservative (again for lack of a better word) brothers are more powerful, perhaps because of the large number of midlevel members of the organization who don't live in cairo and are, themselves, very conservative. They, not the english speaking brothers who work so hard to communicate with the outside world, wield the real power. And they think it's morally wrong, haram in fact, for a woman to be president. ditto a copt. They want to legislate private and public morality. They are opposed to pluralism. And they appear, on the basis of the platform so far, to be winning. I would love to be convinced otherwise. I'm wondering why anyone thinks that the Muslim Brotherhood should develop their policy based on what will make the non-Muslims in the West happy - whether that's George Bush or Marc Lynch. The Islamic system of government is based on shura (a council of experts), so it shouldn't be a surprise that the policy statement included this. It's not a matter of imitating the Iranians. And the leader of an Islamic state should be a Muslim man, because the leader is above all the religious leader. So what it comes down to is that the objections are simply that the policy is based on Islam. And the people objecting won't be satisfied until they take the "Muslim" out of the "Muslim Brotherhood". I agree with much of Dan's analysis - but I think we should wait and see what the final platform looks like before rendering a verdict. It's clear that a lot of the reformist trend Dan and Khaled both mention are opposed to the current form of the platform, and are pushing back - and if they succeed, that says as much as does their initial policy defeat. So let's wait and see how it plays out. Umm Abdullah - nobody says that the MB has to make me (or George Bush) happy. That isn't the point of this, or of the original Foreign Policy piece. It begins from the conditional: IF the MB wants to have better relations with the West, then these are things which might help. Nobody can tell them whether they want this or not, that's up to them. In fact, it's clear that many of the reformists that Dan and Khaled talked about do want this. If they win out in their internal struggles, it will be easier to have productive dialogue and good relations. Of course that's only one factor, and not the most important one, which will go into shaping the MB's evolution - but I think it's worth the effort. Khaled, thanks for your response. In the terms you set out your strategy looks all wrong. If your aim is to promote moderate strands within the Muslim Brotherhood, surely your priority should be to argue the case within the organisation itself rather than directing your time to showcasing the MB's marginal moderates to an English-speaking audience. Its completely lost on me what's to gained by preaching in these terms to a western audience if your priority's internal reform of the MB. Katie, while I attended those events, I can't be sure who is in the audience. You get an idea through those who ask questions and identify themselves. But you raise a good point, and I don't think enough policy makers are attending these events, unfortunately. They're mostly graduate students, academics, thinktank-ers, some people from USAID, NDI, IRI, but not anyone that I can tell is from State, for example. Guardian - why do you assume that the two are mutually exclusive? It surely helps the moderates in their internal arguments if they can show some payoff to their efforts with regard to external attitudes - even if that isn't the only, or even primary, goal. Also, with only one exception (Ibrahim Howeydi) every single one of my interviews was entirely in Arabic. There was no showcasing of English-speaking moderates - that's just factually inaccurate. Sorry if that wasn't clear from the post. There would be far less paranoia in the west if it were more widely understood that militant fundamentalism has appeared at about the same time in the development of Islam as it did in Christianity (Protestant Reformation) - taking about 15/16 centuries in both instances. Fundamentalism seems to have been a necessary stage in the progress to democracy. The Islamic transition is likely to be much shorter as it is residing within an already democratised, capitalised world, especially with globalisation and information technology. The Muslim Brotherhood internal debate seems very healthy to me - it doesn't happen with the Wahhabis! bb, can you explain what you mean by the "militant fundamentalism" that you see now, which didn't exist for the last 14 centuries in Islam? I mean the emergence of states and movements imposing or seeking to impose "purist" versions of religous law, restrictions on public and private behaviour and strictly enforcing them and then attempting to export the "revolution" to their co-religionists in neighbouring or other countries. For eg: the Calvinist "revolution" in Geneva in the 16th century and the Iranian revolution in the 20th. Wahhabis have destroyed themselves in "internal debates"? Where? I am happy to be corrected! (By Wahhabi I mean - from the quick Wiki reference - "Wahhabi theology treats the Qur'an and Hadith as fundamental texts, interpreted upon the understanding of the first three generations of Islam and further explained by many various commentaries including that of Muhammad ibn Abd-al-Wahhab. His book Kitab al-Tawhid ("Book of Monotheism"), and the works of the earlier scholar Ibn Taymiyya are fundamental to Wahabism. Ibn Abdul-Wahhab went so far as to declare jihad against all other Muslims who practiced so-called acts of polytheism. Ibn Abdul-Wahhab's views were opposed to those of the mainstream Muslim scholars of Mecca and Medina of that time. For example, he called intermediation of Muhammad an act of polytheism. Wahhabis see their role as restoring Islam from what they perceive to be polytheism, innovation, superstition, deviance, heresy and idolatry.") My understanding is that wahhabiism is the driving ideology of the Taleban, Al Qaeda and AlQ in Iraq? As for Islamic societies that strictly enforced purist versions of Islamic law and restricted public and private behavior, you could start with the first Islamic societies under the Prophet Muhammad (peace be upon him) and the Caliphs Abu Bakr, Umar, Uthman and Ali. Labels are a distraction from the matters of real importance. What matters are beliefs of the people involved and what they are willing to learn from each other, not the label or mislabel of those beliefs. Parallels to the Christian Reformation are not helpful and are not relevant. And besides, the MB of Sayyid Qutb is not the MB of today just as the Ariel Sharon of 1982 was not the Ariel Sharon of 2005 and the US government of 2009 will be very different from the US government of today. Americans need to get past the scary connotations that the MB name has and look at the people who are the MB of today. The early Christian church also had a pervasive "purism" about it. Then after fifteen centuries of development purism was falling to the economic imperatives of modernisation and secularisation which led to the fundamentalist revival and "reformation" backlash. Fifteen centuries after the birth of Islam the same thing is happening in the Muslim world for the same reasons. If this were better understood by western policy makers there would be far less xenophobia and better policies. Maybe I'm being boorish and naive - but the muslim Brother is dedicated to the establishment of Islamic law. Even if they amend their platform to the point where it passes a liberal "smell test," their goals will not change - and they will find a way to achieve them irrespective of any show platform they may put forward in order to satisfy their western supporters. Sorry, but it seems to me hopelessly foolish to believe otherwise . . .